“Cool as a cucumber” is not just a catchy phrase-it has some basis in fact. A cucumber’s pulp temperature may be up 20° cooler than the outside air. Cucumbers are about 96 percent water. Because their skin holds in moisture like a jug, these vegetables have been used to quench thirst since ancient times. They originated in India more than 3,000 years ago and were soon favoured by desert inhabitants for their cool, refreshing taste. 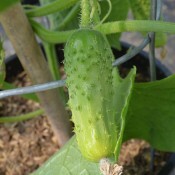 Cucumbers are divided into three classes: the field-grown slicing or table cukes, characterized by small white spines on the skin; the much smaller pickling varieties. Long, slender nearly seedless European or English cucumbers fall into the third category. Cucumbers grow best in a wind-sheltered site with rich organic soil. They are shallow rooted and need a consistent, even supply of water. 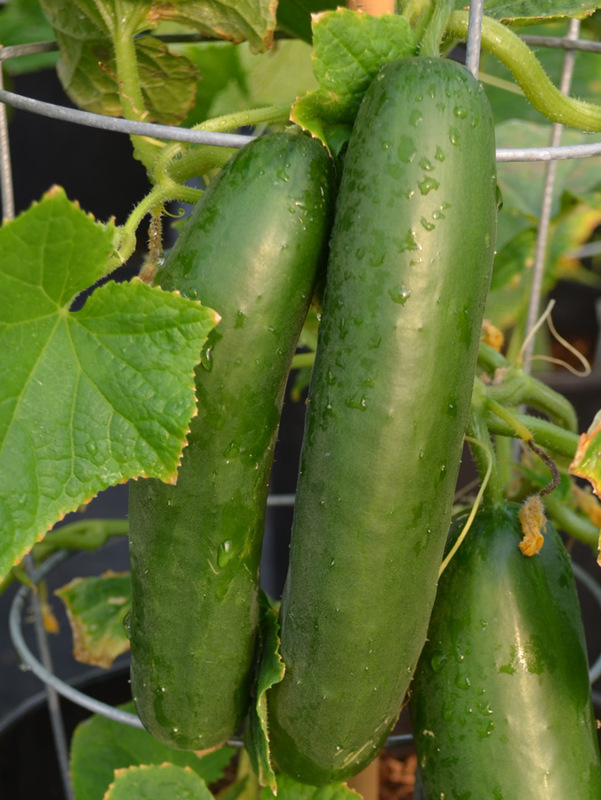 Cucumbers can be grown on the ground, but for straighter, more uniform shaped fruit, grow them on a trellis or in a cage. Once the flowers appear it is very important to maintain even soil moisture, otherwise poor tasting fruits will result. Check the vines daily as some gardeners find smaller fruit more flavourful than large ones. Plant cucumbers with beans or corn since all three enjoy the same type of growing condition: rich soil and lots of moisture. Dill and nasturtiums are also excellent cucumber companions. Dill attracts beneficial insects while nasturtiums promote growth and improve flavour. Do not plant cucumbers with sage, potatoes, rue, or tomatoes. Fair source of vitamins and minerals. One large, unpeeled cucumber (10 - 12 oz) has about 45 calories. It is best to harvest cucumbers early in the morning while the fruit is still relatively cool. Don’t let the cucumber get too large or it may become bitter or pithy. Harvest cucumbers by cutting them from the vine with a sharp knife. Plunge cucumbers into cold water to chill them; then store them loosely in plastic bags in the refrigerator for up to three days. This All-American Selections Winner produces good yields of 12” (30cm) long, seedless, bitter-free and burpless cucumbers. Sweet Success is a vigorous plant that sets crisp, flavourful fruit without pollination. Good disease resistance. This hybrid is a consistent performer under diverse environmental conditions. It produces good yields of uniform, compact medium dark green fruit. An excellent pickler. Good disease tolerance.